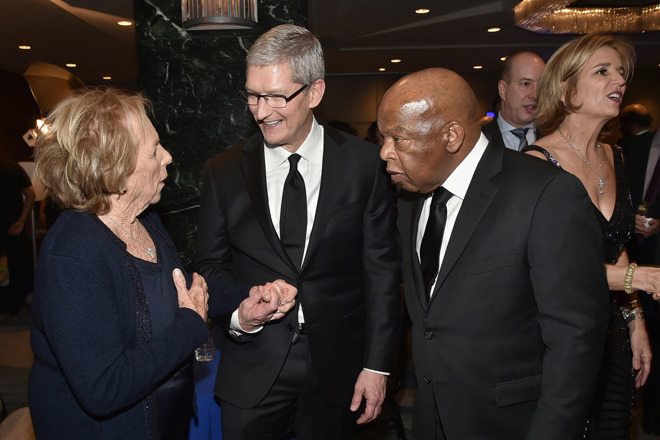 On Tuesday night, Apple Chief Executive Tim Cook formally accepted his "Ripple of Hope" award from the Robert F. Kennedy Human Rights organization, speaking for almost 12 minutes on a variety of hot-button issues. Some topics included online privacy, climate change, LGBT rights, and Syrian refugees, Bloomberg reported. Cook complained for instance that over half of U.S. states don't have legal protections for LGBT people, and argued in favor of accepting Syrian refugees regardless of their religion or homeland. In the wake of the Paris terrorist attacks some Republican politicians have argued against taking in Muslim refugees, or even letting any Muslims into the country. Cook also took time to mention his company's device donations to public schools. "Today, too many children are denied access to quality education simply because of the zip code they live in," he said. "They begin their lives facing strong headwinds and disadvantage they did nothing to deserve. We could do better, Robert Kennedy would say, and because we can do better, we must act." In other parts of his speech the executive contended that business has an "essential role" in helping to fix society's problems, and mentioned the importance of Robert Kennedy in his life, noting that he has two photos of the assassinated politician on his office wall. Cook received the award —a bust of RFK —from Robert's widow Ethel and daughter Kerry. The honor is meant to applaud people in business, entertainment, or activism who support human rights causes. Notably, Cook is an important financial backer behind Robert F. Kennedy Human Rights. For three years in a row the CEO has auctioned off lunch meetings to raise money, each auction pulling in hundreds of thousands of dollars.